What stands out the most for me about the 2000 TV adaptation of Les Misérables are the unusual character choices and the strong presence of the Thénardier family as a real menace. I wanted to like it a lot more than I did, but there’s still enough there that I’d like to see the longer, French version sometime. John Malkovich plays Javert as very matter-of-fact, almost bored. Rather than intensely cruel, he seems like he’d really rather the scum of the street just get it over with and go to jail so he can get back to what he was doing (but you have no idea what that was). Some of that is John Malkovich, but some is the script: for instance, he actually catches Fantine the first time she’s out at night, and lets her go on the basis that she hasn’t crossed the line yet. It took some getting used to, and I’m still not sure how well it worked – but it also made his last hours, helping Valjean carry Marius home from the barricade, seem more in character. I liked that we got to see into Cosette’s head a bit more than usual. What does she think of all the moving, all the name changes? She knows something’s up, but her father has earned her trust, so she comes up with an honorable business-related explanation for it all. Virginie Ledoyen plays her with enough range that she becomes a person (unlike the 1978 cardboard stand-up or the (1952 floor lamp). And there’s a fascinating scene where she and Éponine (Asia Argento) meet as adults. Éponine admits she was horrible to Cosette as a child, but she’s following enough in her parents’ footsteps that she has no thought of asking forgiveness. I also liked Otto Sander’s portrayal of Monsieur Bienvenu as a much more practical Bishop Myriel than the saintly way he’s often portrayed. He’s still kind to a fault, of course — he has to be, since his kindness is literally what changes Valjean’s life — but his wit has a little more bite to it, and he becomes a bit more of a character in his own right (even for the handful of minutes he appears) instead of simply remaining a plot device. 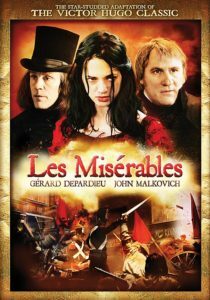 Gerard Depardieu’s Valjean is more driven by fear than other versions I’ve seen. It’s obviously a big part of his character, trying to evade capture for years, but here it seems stronger than his need to pay forward the Bishop’s trust in him. It makes him seem less present? I’ve also seen some remarks on his interest toward Cosette being…a bit strong, shall we say? But that didn’t come through in the cut that I saw, so I imagine it’s different in the longer version. One of my favorite things about this version is that almost everyone is involved. The Thénardiers don’t disappear after one scene, we see them again in Paris — and they’re not comic relief, they’re full-blown villains. Even Azelma’s included. Éponine’s actually meaner than in the book, which is the opposite direction that she’s usually taken, though Azelma’s more thoroughly their parents’ daughter. Overall it’s a more faithful adaptation than most of the movies I’ve seen, and there are tons of details showing that they really did their research, like little Éponine swinging on a cart chain when Fantine and Cosette arrive in Montfermeil, or Mme Gorbeau, or the festive atmosphere before the barricades go up. But there are also a lot of odd, random changes that don’t seem to be there for movie logic or adaptation reasons, just someone wanted to do something different. I mentioned there’s a longer version. Apparently this miniseries was produced as a four-part (1½ hours each) miniseries in French, and cut down to two parts (also 1½ hours each) in English. The cast is mostly French and German, with a few exceptions like Malkovich and Argento. Literally 50% of the running time was cut, which is utterly ridiculous. In the version I watched, part one runs from Valjean’s prison time through Cosette leaving the convent, and part two picks up with Marius and Cosette meeting in the park, and runs through the rest of the story. Yes, all the way to the end. Part one works dramatically. Sure, more detail would be nice, but it all flows together well enough. Part two, however, has several places where you where you can tell that parts of the story are missing. You can put together what must have happened, but the gaps stand out — especially during the barricade section. I’m really curious to see the full version. How much of the story flows better? What scenes made the longer cut? What other things did they change that didn’t make it to the shorter release? And heck, what other weird things did they change that don’t make sense? This entry was posted in Reviews and tagged Adaptation, Movie, TV on November 5, 2017 by Kelson Vibber.